"Available on the State of Utah Contract 1231"
Bedlifts is a cost effective hospital bed storage system designed to store hospital beds off of the floor and stack them securely in a vertical arrangement, which not only saves valuable floor space but removes potential fire hazards from hospital corridor. 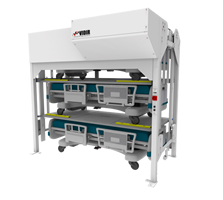 This hospital bed storage rack will increase the hospitals maintenance departments’ capacity, organization, and product flow reducing down time, which increases the number of beds available for patient use at any given moment. Additionally, by removing unused ‘hallway beds’ from the corridors, hospitals will meet JCAHO standards for the storage of hospital beds and not risk further fines or worst case, the loss of accreditation. 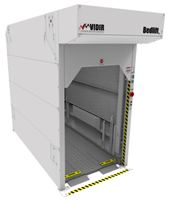 Vidir Machine is a leading manufacturer and worldwide supplier of automated storage and retrieval carousels. Vertical Carousels take advantage of unused overhead space to save space, increase productivity, and improve workplace safety. 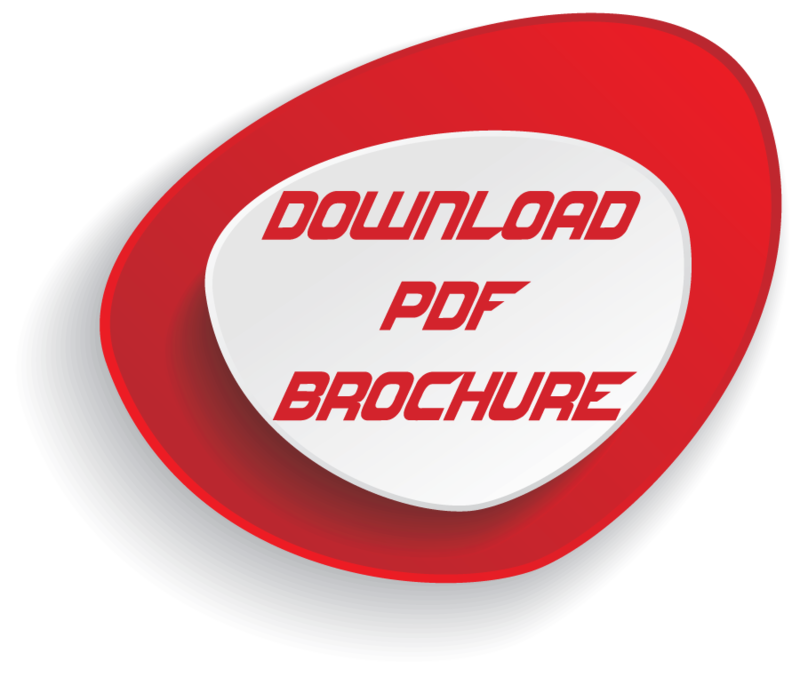 Automated storage and retrieval carousels can be found worldwide in over 30 different countries. 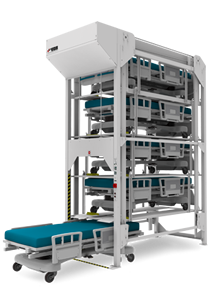 The Bedlift is a hospital bed storage system which can accommodate hospitals auxiliary beds, beds in maintenance, and provide secure storage zones with a closer proximity to patient areas. 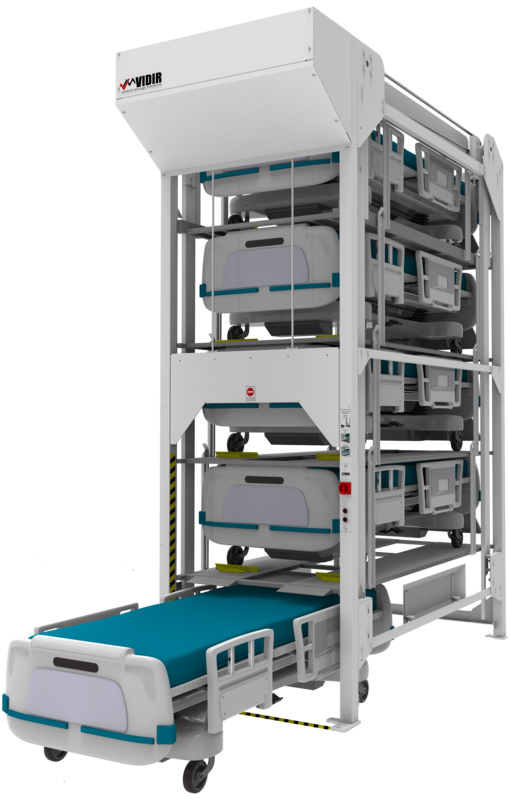 The bedlift is a hospital bed storage system that can store up to 5 hospital beds vertically in a footprint slightly larger than a single bed. They are frequently used to store hospitals overflow beds, beds in repair and auxiliary and specialized beds. 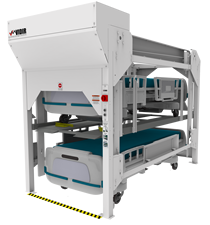 They are also used in some situations to provide easily accessible storage banquet beds closer to patient areas to reduce turnaround time to get the beds. The average Building cost for a hospital is $400 + per sq. ft.
At any given time 7 – 10% of all hospital beds are in maintenance or repairs. What bedlift can do to improve the space? Reduces hallways “clutter” to address NFPA 101 – Life Safety Code. 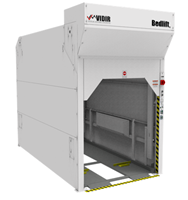 The bedlift is successful in hospital maintenance rooms, storage rooms, and zoned corridor space. 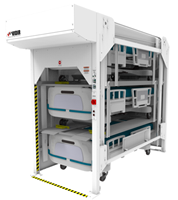 Additionally, the most successful installations have multiple storage locations to reduce the response time for a required bed as well as reducing the labor to retrieve the hospital bed. Who can benefit from Bedlifts? What Is Your Available Ceiling Height? What Size Of Beds Are You Looking To Store? Do The Headboards Need To Be Removed And Are They Any Vertical Attachments? 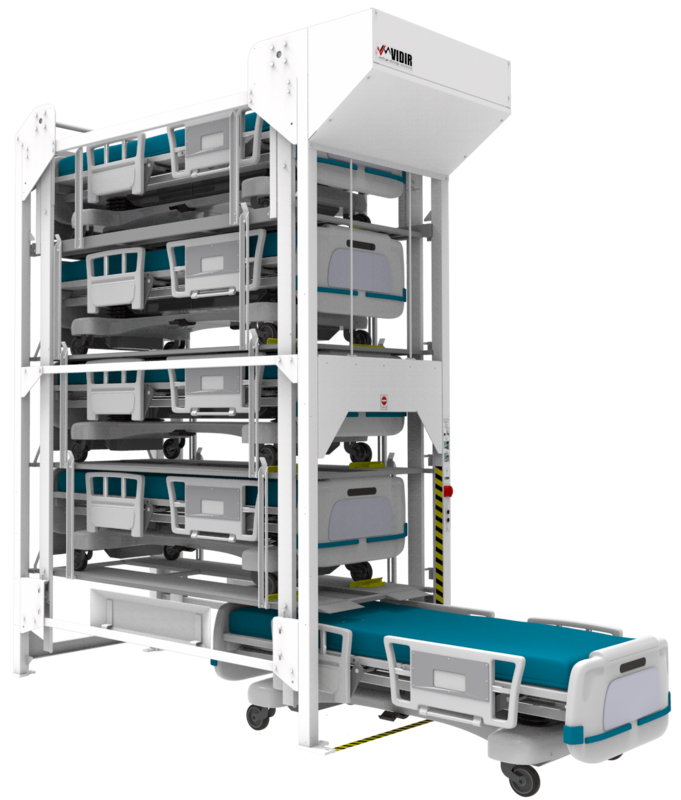 The R Series is designed to accept 80-90% of all hospital beds with a vertical pitch of 27” and capacity of 600 lbs. per position. The unit loads from the front. 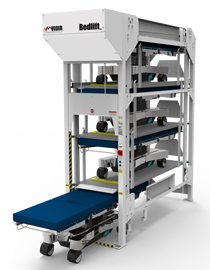 The X Series (Extra Capacity) is designed to accept the remaining 10-20% of beds with a larger vertical pitch of 33” and capacity of 900 lbs. per position. The unit loads from the front. The S Series (Side Load) Bedlift is designed to load using the width of the bed requiring less floorspace for loading. This is for spaces with a unique profile and space constraints. The N Series (Narrow) is designed specifically for narrower profile beds. stretchers, and operating tables. The unit has a width of 31.5”. The unit loads from the front. 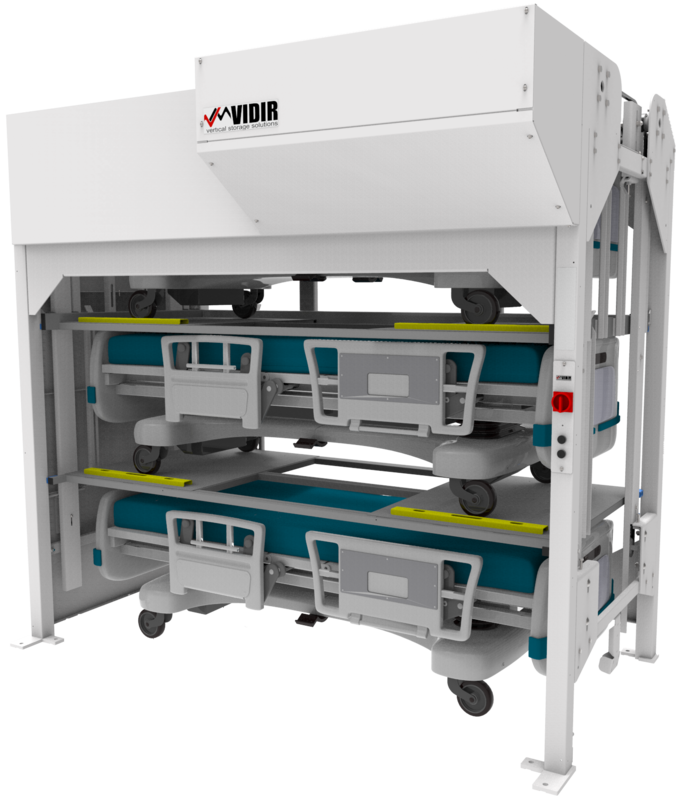 The Vidir Hospital Bedlift is a cost effective hospital bed storage system designed to store hospital beds off of the floor and stack them securely in a vertical arrangement. This not only saves valuable floor space but removes potential fire hazards from hospital corridors. This hospital bed storage rack will increase the hospitals storage capacity, organization, and product flow; reducing down time, which increases the number of beds available for patient use at any given moment. Two Seismic Installation Scenarios have been developed and approved though OSHPD for the installation of the Vidir Regular Capacity Bedlift and Extra Capacity Bedlift. Covers ground floor installations only. Anchor’s must have at least 10” separation form concrete slab edge. Consists of an additional rear anchor kit and two additional front anchors. 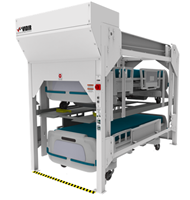 Will be required in every Bedlift installation that requires OSHPD approval. 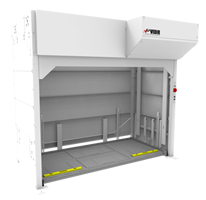 The package provides OSHPD coverage up to the SDS rating specified in the accompanying chart for a single Bedlift regardless of quantity or positions. In addition to the anchoring required in seismic installation scenario 1, this consists of a side mounting kit to connect two units to one another to increase the SDS rating that multiple units are certified to. The package provides coverage up to the SDS rating specified in the accompanying chart for 2 units connected, side by side. Anti-Microbial Paint- Increased protection against 99.9% of all common pathogens as well as additional properties that are resistant to mold, mildew, fungus. Bedlift installation takes 6-8 hours with 2 installation technicians. Service and maintenance is recommended every year.